Telling the inspiring true story of a treasured Olympian’s capture and imprisonment in a prisoner of war camp in WWII, “Unbroken” hit theaters on Christmas Day.“Unbroken” is the story of Louis "Louie" Zamperini, the child of an Italian immigrant family. As a child, Louie was always in trouble until his older brother took Louie under his wing. Under the training of his brother, Louie began destroying high school track records. His skills got him onto the United States Olympic team and to the 1936 Summer Olympics in Germany. Before Louie could make it to the 1940 Summer Olympics in Tokyo, he was drafted into the U.S. Army Air Force for World War II. Louie’s enlistment into the Army began a string of events that would challenge his will to live to the final thread. Louie lived through every war fear and pain imaginable and had to stay strong to make it to the end. This movie was absolutely amazing. 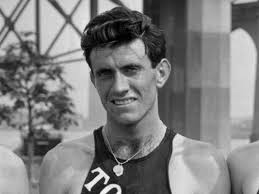 “Unbroken” is incredibly inspirational and is a great tribute to the late Louis Zamperini. I highly recommend this movie to everyone, no matter what kind of movies they prefer. It is a little intense for children, however. I give this movie a rating of five cardinals, for it is truly one of the greatest movies I have seen in a very long while.